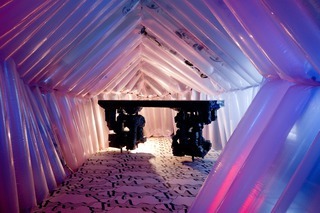 An inflatable pavilion made from off-the-shelf components, which assumes a role within a fictional short story about Detroit. Digest scaffolds experimental art, architecture, and design upon a fictional short story narrative in an effort to stoke alternative urban discourse. This dialogue is meant to be widely accessible, and is therefore crafted from the perspective of a young child. The story unfolds at multiple scales and across varied media – purposefully pitting material, color, surface, and story against one another. 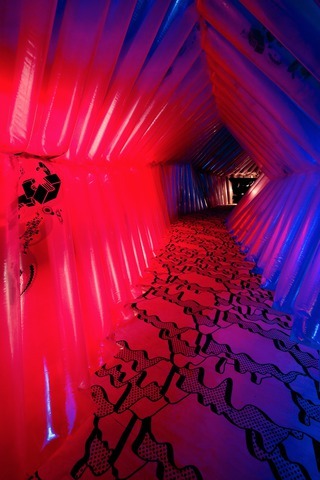 The centerpiece, an inflatable pavilion, becomes both immersive environment and an actor within the story itself. 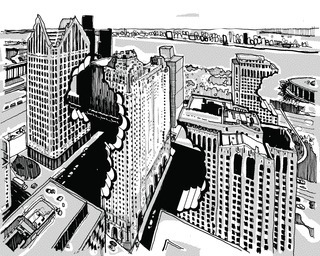 The process is led by storyboards, comic books, and strategically implemented objects. 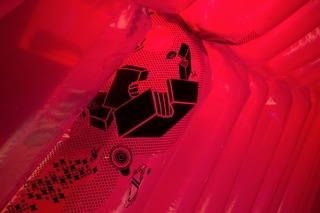 Digest is an inflatable shelter system built form off-the-shelf components. The shelter's canopy bootstraps materials from the medical and food industries, while its foundation merges environmental graphics with a structural plenum. The integration of these systems has a single continuous loop woven through a subfloor which ultimately inflates into an intimate space. The aesthetic culmination of these systems strives to associate this thing with some terrific beast, or tentacle, or guts. The canopy is made out of polytubing, an inexpensive type of plastic used to vacuum-pack food, better know by its commercial name, "bag-on-a-roll." The polytubes are woven together using laparoscopic bands, a neoprene strand typically used to control the stomach size of gastric bypass patients. The lap bands form a sturdy structural truss that gives digest an easily adaptable height and profile. 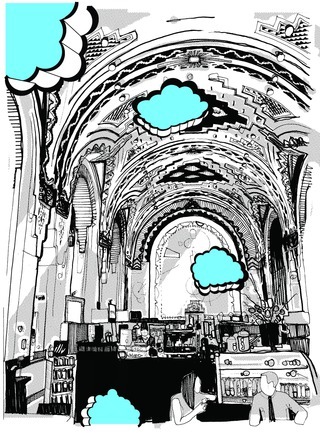 Halftone patterns, screen printed on the polytubing prior to erection, make it possible to tailor the transparency and further the short story narrative through environmental graphics. 4/ TV couldn’t really understand why some buildings were gobbled up while others seemed to be left alone. 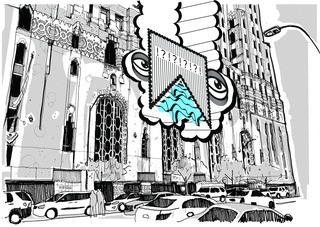 5/ she began to think about her favorite place, the Guardian Bldg, and wondered if it too would meet with the same fate.